Enjoy the exclusive Edgewater Beach Resort in this two bedroom, Gulf-front unit - whether it is lying at the lagoon pool listening to the band or lazing at the beach listening to the magnificent waves. This Tower I unit has a breathtaking view which will make your vacation one you will not forget!!! Just remember at Edgewater, there is no need to leave the premises - they have got it all. 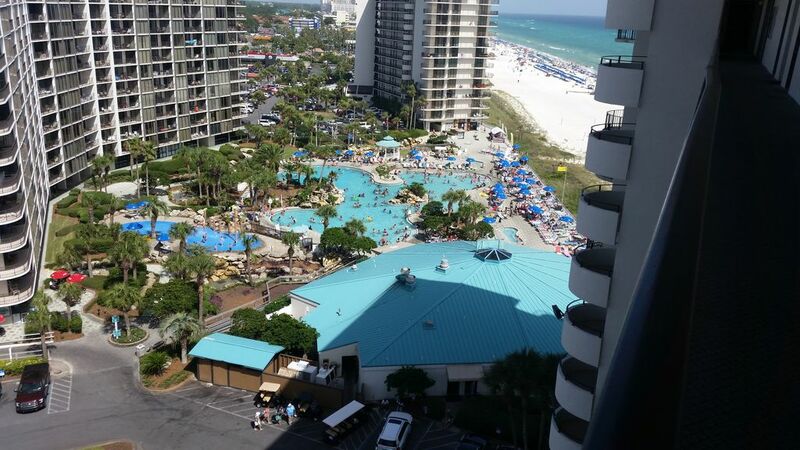 Load up your swimsuit and head to Panama City Beach. Owner at Edgewater beach resort since 1999. Experience with working along with guests on reservations and making your stay pleasurable. Edgewater is the only true resort at PCB. Most amenities and a true self-sustained complex. Never have to leave. Beautiful tropical surrounding and enough space to walk beachside or on the golfcourse. this condo has a beautiful view of the lagoon pool and beach. It is tastefully decorated and never leaves you disappointed. onsite restaurant - serving breakfast, lunch, dinner within budgets. 11 pools -4 beachside and other villa side. hot tubs, golf, gym, basketball, much more. located close to the Edgewater mall which can be easily walked. this condo has one of the most magnificent views of beach and lagoon pool, with the night view breath-taking. We had the most amazing week at Edgewater thanks to Cheryl who had everything ready for us when we arrived. This was my first experience using VRBO and it couldn't have been easier or better. This was a graduation trip for my grandson and he had a ball meeting other young people and enjoying all the water and entertainment activities. Pizza, volley ball, movies, surfing, golf all on the resort--it was such a happy place to enjoy the sun. Our condo was tastefully decorated and the kitchen was fully stocked with everything one needed to cook. We ate at the Ocean's Restaurant several times because it was so convenient and the food good. The Lagoon pool and beautiful white sandy beach were gorgeous. Security was excellent. I would recommend it for all ages. Pier Park with lots of restaurants and shopping is near by and my grandson loved fishing in the Gulf! Red Snappers were biting big time! Thank you, Cheryl for everything. We hope we can return in the near future. Glad you enjoyed our home away from home. its alway nice to meet guests and hopefully help them out. Enjoying the beauty of Edgewater and all it has to offer. We stayed for 4 night .. We stayed on the 10th floor.. The view from balcony was spectacular !! The pool was absolutely gorgeous .. The beach trip was perfect !!!! The condo was very clean and pleasant place to stay.. Thank you for letting us stay at your condo.. I'd recommend for anybody to stay at this property..
Glad you enjoyed our home away from home. Thanks for taking care of it. Great location, well stocked kitchen, nice condo! We love Edgewater! We enjoyed our 3 day weekend in your 6th floor condo! We had great views of the beach and the lagoon pool! Loved being near the lagoon pool, the splash park was fun for our young grandsons and the beach was right there, too. The tile in the living area wasn't as clean as we needed with a crawling baby; but, cleaning supplies were in the unit and it only took a couple of minutes to mop the floor. The linens were nice, the beds comfortable, the condo was just as described and Cheryl was very easy to work with. We will definitely contact you again to stay in one of your units. This was our 1st time using vrbo. We were completely satisfied with our experience. My family had a great week at the beach. The weather was perfect! Your condo is beautifully decorated with an awesome view of the lagoon pool and beach. Thanks Cheryl (owner) for all your help with the reservations. It was a pleasure talking to you. Looking forward to staying with ya'll again. We enjoyed our stay!! we love you to enjoy our home away from home and we never get tired of this beautiful view. rain or shine. winter or summer. thanks for taking care of everything. Four seniors (two couples) enjoyed some quiet down time following a stressful Christmas. Lots of glass facing breath-taking ocean front. So peaceful! Space was as described with open LR, DR, K across front; huge granite bar area, two spacious bedrooms in quiet back of unit. Three generous flat-screens for watching all of the Bowl Games when not shopping, enjoying fresh seafood, or perusing Pier Park. Loved Montego Bay Restaurant (very near to unit) as well as The Captain's Table and Uncle Ernie's in Panama City proper. Neat and clean with plenty of amenities. I would return tomorrow if I could. Thanks Cheryl! thank you for taking care of our condo, our home away from home. Never get tired of going to Edgewater ourselves, does not matter the season. Christmas/New Years is a great time of year at the beach. does not include holiday or special event rates mandatory evacuation by PCB - full amount reimbursed. $40 additional process charge for any cancellation before 30 days. up to 2 weeks other refundeded. within 2 weeks all of rental is kept.